Satya has ceased publication. This website is maintained for informational purposes only. All contents are copyrighted. Click here to learn about reprinting text or images that appear on this site. • Know the issues. Education truly is the key to liberation. Watch undercover footage, read books, magazines, brochures, and listen to lectures and podcasts. The more knowledge we have of animal exploitation industries the more articulate, powerful and effective advocates we can be. • State your mission and find your focus. There are so many issues facing animals today (factory farming, companion animal overpopulation, fur industry, vivisection, rodeos, zoos, etc.). Identify the focus of your organization. Many grassroots organizations try to tackle every issue facing animals and by doing so find themselves spread so thin they are unable to make much meaningful progress in any one area. Having a clear mission statement will make the road to building your organization a much smoother one. • Select your audience. Who is the audience for your organization’s message? What is the best way to reach them? These are important questions to answer before developing materials, lectures, etc. • Implement a database to keep track of members and donations. It really is the foundation for your organization. • Get online, implement a website where you can post events. Have a way for people to sign up on a list through your website. Make sure it is clear that everyone is welcome and it’s open to the public. • Start an e-newsletter. It doesn’t have to be fancy or anything. Just send out an e-mail newsletter every month to your membership keeping them up to date. • Literature. MFA used literature from a number of different organizations for years before we started developing our own. Developing your own literature can be time consuming and financially taxing. It may take a while to have something of your own. • Events. I think it’s important to develop relationships with activists in your community. People are definitely more likely to come back and stay involved in an organization where they feel they’re a part of a family and feel that they’re respected. • Find the right mindset and attitude. Never underestimate the power of one person. • Finally, the best advice I have is, talk with people who have been in this field and ask them what has and hasn’t worked. Know you’re not alone—there’s a lot of people out there willing to guide you in the right direction. Growing up on a small farm in St. Paris, Ohio, population 2,000, Nathan Runkle learned two things: he loved animals and too many people around him were harming and eating them. At the young age of 11, Nathan saw activists protesting fur on the news, motivating him to learn more about animal issues. He became veg, and after attending the FARM Animal Rights conference in 1997 in Washington, DC—and meeting a real, live vegan—he decided it was time to act. Returning to Ohio, Nathan realized no one was doing anything locally about animal cruelty. Without support from family and friends, he decided to do something. 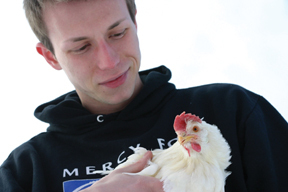 At 15, Nathan founded his own nonprofit animal rights organization, Mercy For Animals. Nathan Runkle is a sign there is hope for animals in the world. With a branch in Ohio and now in Chicago, Mercy For Animals is one of the most active and effective grassroots groups in the U.S. Their undercover work and media savvy have gained them commercials on MTV and local channels. They have over 10,000 members, and tirelessly work to change the fate of the billions of animals used for human consumption. Taking a moment from directing their latest campaign, Nathan Runkle spoke with Maureen C. Wyse about what it’s like to start and run an animal rights organization on nothing but motivation. What was the inspiration behind starting up Mercy For Animals? In 1999 there was a local animal abuse case at our nearby high school. The agriculture teacher brought in a bucket of day-old piglets from his hog farm to be used in dissection projects for the class. But when he arrived at school, one of the piglets was still alive, vocalizing, blinking and stressed. One of the students, also a worker on the teacher’s hog farm, took the piglet by the leg and slammed her head into the concrete in front of the class. The piglet was still alive. Her skull was broken, she was bleeding out of her mouth, gasping for air. Two other students were so appalled, they took the piglets to a teacher who was known as a vegetarian and animal activist. She had the piglet euthanized at the local veterinarian and contacted PETA to try to get animal cruelty charges pressed against the teacher and student. This became a big deal locally. It was in all the papers, on TV and brought some local people concerned about animal issues together. It also brought the local hog farming community together, rallying behind the teacher and the student. When it went to trial it was dismissed the very first day because it was considered standard agricultural practice to kill baby piglets in that manner. In Ohio, and at least 30 other states, there are exemptions for common “standard” agriculture practices. So the cruelty charges were dismissed and the teacher who helped actually lost her job. That case illustrated a real need on a local level for a voice for farmed animals. We started the organization, not just for this one animal, but she was a face for a larger national problem. We believe there needs to be local efforts for national problems. We started out as a very small organization in Urbana, Ohio and gradually grew to a statewide organization in 2001 after we did our first two egg farm investigations. You were only 15 when you started MFA! How did you do it? We started with zero dollars in the account and zero names on our mailing list. It was the teacher who was fired after the pig farm incident and I. Since we were both located in the same area, and had so much in common, we connected and started doing activism. She’s no longer involved with the organization but it was really just the two of us to begin with. How many are you now? The organization has really grown a lot since. We consider our membership to be about 10,000 but we really only have two full-time staff members, myself and Daniel Hauff in Chicago. We have volunteer coordinators in all the major cities of Ohio and core volunteer activists who help out. What would you say is the hardest part of running the group? Keeping our spirits high when dealing with depressing issues every day. We’re constantly having to take photos and videos of animals suffering in the most horrific ways and then reviewing them. Just finding the motivation and inspiration to continue while primarily promoting a vegan diet. I think a lot of people get frustrated because it’s something without a big victory at the end of the day. It’s important to identify small victories, every time someone is inspired to become a vegetarian or vegan or just becomes aware of these issues. Planting seeds that may later grow and lead to a more compassionate lifestyle. I find that very rewarding. Animal cruelty isn’t an issue people tend to want to think or talk about. But it’s certainly something that isn’t going to go away if we all just close our eyes and ears to it. Also, for a small organization, we wear many different hats. From being spokespeople to developing materials, to doing investigations, to organizing events, it’s a lot. But really I do enjoy it and I can’t see myself doing anything else. What are some of MFA’s goals? MFA’s ultimate goal is to build a society where animals are treated with the respect and compassion they deserve, to shift how society perceives and treats animals. We focus primarily on farmed animal issues because that’s where the vast majority of animals are. Because we have limited time and resources, we try to focus on the area where we can make the biggest impact. We aim to be a consumer education organization, to investigate factory farming and slaughterhouses and get the info out to the public. And always encourage people to lead the most compassionate lifestyle as possible. What are some of the campaigns you have worked on and are particularly proud of? We just came out with a new commercial called “The Fairy Tale is Over,” a chilling rendition of the song “Old MacDonald” with factory farm footage. We have a number of commercials we have been airing for the past three years and we’ve found it to be really effective in reaching an audience of younger individuals; people who tend to be more open-minded and receptive to vegetarianism. We also have humane education programs, where we speak to high school and college students about factory farming. We do a lot of educational exhibits at festivals and concerts. We leaflet, do demonstrations, feed-ins and lectures. In December of 2006, we launched 100 anti-fur bus ads in the Chicago CTA red line system, which we were very excited about. We also do undercover investigations to expose the abuse of animals in factory farms and slaughterhouses. They are a good way to show exactly what’s going on and puts a name and story on the suffering of all the animals. We want to create an army of advocates locally. One thing that prevents people from going out in the streets and talking about these issues is they don’t feel they are armed with all the necessary facts and figures and sound bytes to answer questions. We feel that if we can educate local activists about these issues, they’re going to become more confident to go out into the community and be true activists on behalf of the animals. We’re constantly trying to identify how we can be as effective as possible. We strongly believe that grassroots activism is really essential to the animal rights movement so we hope to continue to grow and expand and reach more individuals and help more animals.